Because for the orphans it was probably the first Christmas festival in their lives. In a country like India, there are thousands of these little, lost souls who live on the street without their parents, or find accommodation in an orphanage in the best case. Here in some families cows are more sacred than their children – and you can feel that, especially when it comes to the female descendants. Some of them are killed in the womb – an illegal venture – , others are outcast or even exposed. But in the orphanage, there weren’t just small girls, but also many orphaned boys. The reasons why they lived there hadn’t been explained to us. Probably luckily because it would had broken our hearts. But their little faces summed up their short, hard lives. We entered slowly the small mud house, somewhere in the margins of Hyderabad, not far from the slums. The plaster was crumbling from the walls and the wall paint had already joined the demolition tenor. Three rooms, not more, that were called the play and learning area for about twenty children. Maybe 30 square meters. The dormitories were reachable via a separate entrance – and probably not even bigger than the rest of the house. The play room was completely crowded with children. Nicely dressed, they sat on the cold, dirty wooden floor. A little girl raised our attention particularly. She was with about one year the youngest of the orphans – and thereto very shy. I remember her black, sensitive eyes and her small permanent runny nose until today. So defenceless and unprotected, she snuggled into our arms. She was more like a doll than a small child. She didn’t speak, barely moved and she was breathing gently. You could only imagine what she had already been through in her short life. I would like to baptize her “Anshana” which means something like “brave warrior” in Hindi. Dinesh, an Indian who had inspired us doing a Christmas celebration at the orphanage, rose to speak. He told the children that Santa Claus is just waiting around the corner – and that he had brought a gift for everyone. Their curious faces turned immediately into broad grins. Gifts – something they normally never receive. Anyway in Indian culture giving on Christmas is uncommon. Because for Hindus this festival has no special meaning. It’s just another day off between all the sacred festivals, between Diwali, the festival of lights and the spring festival of Holi. But in order to preserve the tolerance – and to propitiate the two percent Christians in the land – December 25 is officially Christmas holiday. 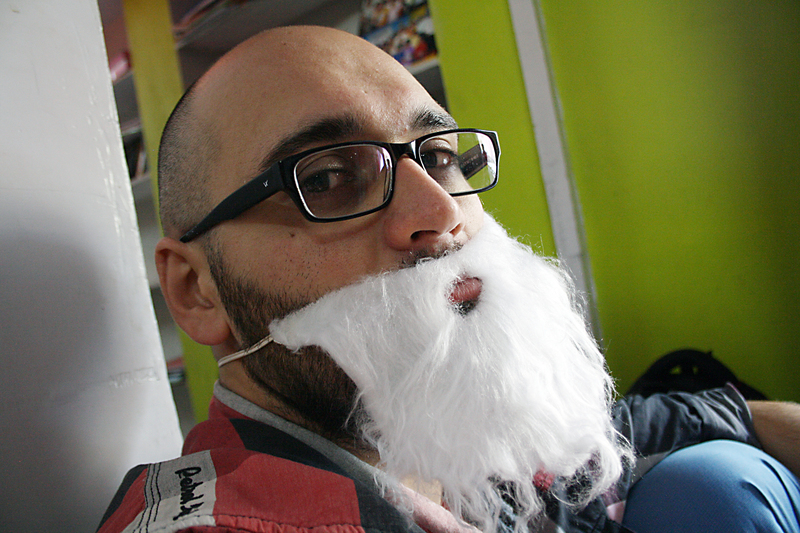 Shortly after “our” Santa Claus entered the orphanage and sat down in front of the orphans. The reverence was felt immediately – and the children’s murmur turned into deep silence. One child after another was called by Santa Claus. He reached into his jute sack and grabbed a small gift for each of them. Beforehand all of us had donated a few rupees to realize a little dream for everyone. 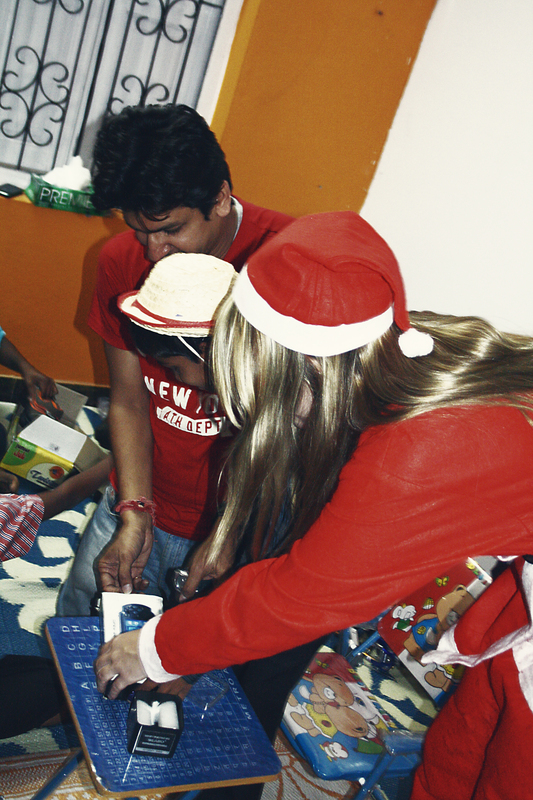 The caretakers of the orphanage had actively supported us in the gift selection – by telling us the children’s wishes. Cars, dolls, candy and clothes were even hidden behind the colourful wrapping paper. Impatiently the orphans ripped open their gifts and immediately began to play with them. We had reached our goal: The children were happy – and we, too. Because it showed us the true meaning of the Christmas eve: altruism. And for that I had to travel 8,000 kilometres, to experience this feeling in its purest form. Somewhere in India, surrounded by almost forgotten souls who couldn’t have been happier on this warm day with 30 ° C.
Sad – That’s true and it was worth it going there.